When up or downscaling the recipe you say how much eggs, flour and butter to use but don’t mention the change in the amount off eggs? Hi Scar 🙂 In the example I give, I say ‘to cut the recipe in half’. Half of six eggs is three eggs. It’s really easy to work out – if you divide the recipe by 6 (it has 6 eggs), you can then times it by whatever number you want. So a bigger but not double sized cake for example would have ten eggs. Hi. My rainbow cake layers are in the freezer Now. Just wondering if I Should take the layers out of the foil TO DEFROST or leave them in? Is overnight in the FRIDGE best or can I just take out of the freezer AND defrost on the side the day I want them? HI Kerry – the cake came out very very dry for me. i followed everything and definitely did not over cook it. why does this need extra baking powder? too much baking powder makes a cake crumbly DOESN’T it? Hi Victoria! I’m not sure what could have happened other than your oven running hotter than you think… it’s not something which other people has told me has happened to them and a LOT of people have made this cake :). I followed the instructions for the 10″ cake tin size using 465g of sugar, flour and butter. also upped the eggs by 2. the layers are pretty thin and dense. edges are very unforgiving as you can imagine. i am sticking them in the freezer and hoping a tonne of chocolate frosting will help. will give the cupcake recipe a go tomorrow as i have 35 kids comning to the party and the cake will probably serve 12-16 at this stage. hopeful i can make the cupcakes work (anyway, wondering if this could this be from the additional eggs? am not a regular baker…should I not have added them? any other tips. Hi Chantal! Not sure how the cake turned out, but the layers shouldn’t be thin and dense at all… I’d recommend checking the dates on your baking powder and self raising flour. The only other way the edges could be hard is if the cakes were overbaked. Hi Kerry, love the look of this recipe especially your suggestion of dispoSable foil tins as i’m not an experienced baker! Do you think i could freeze the cakes in the tins And just wrap around them rather Than remove the cakes first or would this make it trickier to remove them once they’ve defrosted? I’m Planning on making this for my son’s 2nd birthday this coming weekend. Thank you! Hello! I’d never thought of that before but you can absolutely freeze in the tins! Once they’re frozen it should be easy to peel the tin foil away from the cake 🙂 good luck! I wanted quite thick layers and i am doing it in 7 inch cake tins so should i double all the ingredients or just leave it the same? what would you recommend? Thank you so much for your amazing rainbow cake recipe. Made the cake for my son’s 4th birthday and everyone loved it. Slight panic when frosting was lumpy but followed your advice and it was recovered. Everyone loved the cake, it tasted ANd looked fantastic! Hi. Please can you confirm what temperature is needed for a Fan Assisted Oven? I’m guessing the 170 degrees that you state in your recipe is for a conventional OVEN? or is it 170 Degrees for FAn OVEN? Please confirm! Thanks so much. Ive used this recipe three times now and just wanted to say its really nice! Ive had lots of compliments on the taste. I put the mixture into 3 8 inch Tins and did this twice to get 6 big layers and they came out really nice. Thanks! I tried this yesterday as a test so just made half and while the cakes tasted ok, tHey sunk in the middle 🙁 any ideas what could’ve gone wrong? I followed recIpe… so i Thought! WanTed to make it for my little girls 4th birthday. Sorry this is in caps. Its not letting me chaNge it! No worries Mila, sorry about the caps! I’d double check that your self raising flour and baking powder are as fresh as can be. Sinking can also sometimes be caused by jostling the cakes before they’re risen, but I’ve never had that happen with rainbow cakes and I do move mine around in the oven quite a bit. Good luck! Hi Kerri, after practising last week I made the rainbow cake last night (WEDS). (v. EARLY THURS morn) as I need to decorate it late-ish (8pm) TOMORROW night (Fri) ready for the party on Sat? Also, I have never frozen a cake before so how long would it need to defrost? Hi Clare – I’ve only now seen your comment, so hope people loved the cake! Hi Kerry. do you think I COULD DIVIDE THE MIXTURE INTO 3 8 INCH TINS TO GIVE THICKER LAYERS? IM MAKING A Birthday cake and dont think a 6 inch is big enough in diameter. i was thinking of doubling the ingredients instead. have you done this before? Sorry about the capitals, dont know what happened there! Hello! That’s a great idea – I would double the mixture if you want quite thick layers. The cake would be quite tall but it should be a showstopper! Can I use the same recipe to bake a rainbow swirl cake (separate the batter into 6 colours, but then put all the batter into the same cake tin and bake at the same time)? How long would I bake the cake for then? I Made This Cake Last Week For My Friends Birthday And It Turned Out Really Well! I Chose This Recipe As I Was Looking For A Traditional Sponge (Some Others Looked Quite Dense). It Took A Few Hours As I Only Had 2 Cake Tins So Had To Make 3 Batches And Wash Up In between. I Already Had Bought The Dr. Oetker Food Gels From A Different Recipe I Looked At And After Reading The Comments I Was A Bit Sceptical But The Layers Came Out Bright And Distinctive (I Used A Tsp Of Each), Although The Yellow And Orange Looked Very Similar. The Purple Looked A But Dull SO I Added A Bit Of Red. Thanks For A Great Recipe, I Will Make Again For A Special Occasion! Hi kerry! 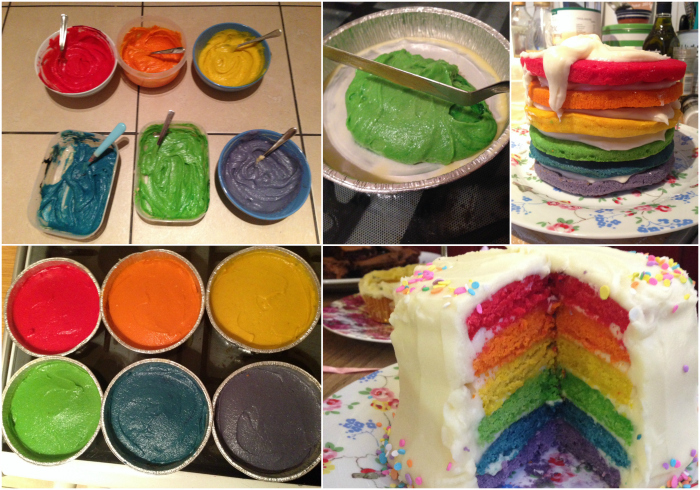 The cake looks amazing (and your blog too) I was WONDERING if I can use this for the concentrated food colours? Iam based in Dublin. http://www.tesco.ie/groceries/Product/Details/?id=252155972 Thank you!!! Nope – these are the worst possible ones to use! You need to use gel food colouring like the ones I link to in the post. i was wanting to make the cake today and freeze it till monday thats 3day .how long can i freeze it for ? I am so impressed – it was so easy. used 8 inch foil dishes and discovered they can be reused for my next one – as I have been careful. now for the icing …………. I followed the recipe step-by-step and the cake was delicious and a show-stopper. Cooking time was approximately 17 minutes per batch of 4 alternating the cakes on the oven shelves once after 10 minutes. THE RAINBOW CAKE LOOKS SO AMAZING. I CAN’T WAIT TO TRY IT. iT WILL BE A GREAT BIRTHDAY CAKE FOR MY KID. tHANKS FOR SHARING. Hi kerry ,my friend told me that if i beat the egg whites to meringue and fold into the batter cake it will becomes super moist , it is okay , Or it will infact my cake taste or texture ? 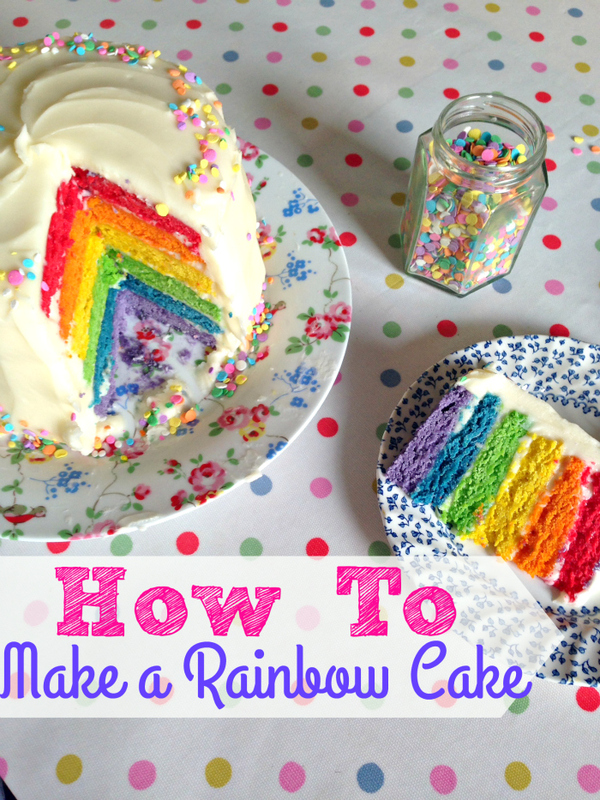 Hi Adeeba – I haven’t tried making the rainbow cake using this method – if you do try it, let me know the results! Hi kerry i hope.i get a.reply.from.u. Hi Poldi, yes you still need the extra baking powder on top of the self-raising flour – as the recipe says. How far in advance can you bake the cakes and freeze them without affecting the quality please? Many Thanks! Hi Kasha – up to three months! Hi Adeeba – you’ll need to convert the recipe yourself – there are many websites that can help you do that. I am attempting to make this for the first time, for my daughter’s birthday on friday. as it needs to feed 40 people (adults and children included), i think i may follow your suggestion and make a rectangular version (although i believe round looks better visually). Perhaps rectangular will cut easier for this amount of people. I saw that your suggestion for this shape leads to a link off your site and to other recipes, but ideally I’d like to use your recipe. Can you tell me how to adjust YOUR recipe for this? I thought perhaps using the trays of a regular sized (60cm) oven may work for the size. Suggestions? SAME GOES FOR THE FROSTING…. HOW MANY BATCHES (of the above recipe)? THREE? Thanks for your help in advance! Can’t wait to make it!! 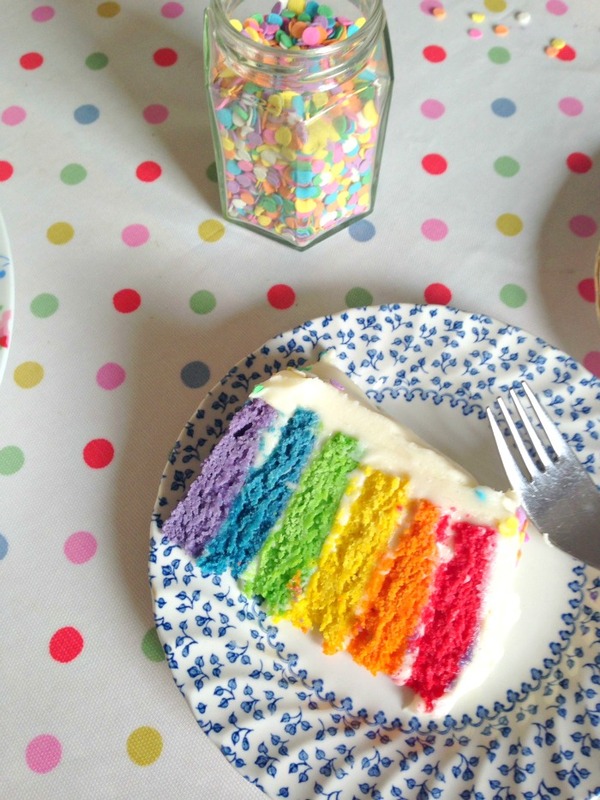 2 – make large rectangular rainbow cake big enough to feed 40. Dr Google tells me that you’ll need a sheet pan 11 x 15 inches to feed that many. I’m afraid I’m not good enough at maths to do the calculations for you and it depends on what size cake pans you have – you need a deep kind, like a very large brownie tin or large roasting tray. I’ve found this link though that can help you (based on the size of your pan) work out how much cake mix you’ll need for one layer. I would say that the entire cake recipe produces 8 cups of batter at the moment. I’d recommend option 1 to be honest! Hi Kerry, i dont have an oven big enouge to cook all 6 without stacking them in the oven, is that ok? Also Whenyou talked bout rotating your cake pans, what does that mean? Can i make them in batches? Will it affect the quality of the cake? Hello! That’s not a problem. One oven shelf (in my oven anyway) is big enough for 3 of the cakes, so I normally do 3 on the middle and 3 on the bottom, then swap them over as I don’t want any to become too browned, or to rise up in the middle – that way they stay nice and flat. Hi kerry! That rainbow cake looks amazing cant wait to try it. Im from.tropical philippines and im.wondering if theres any way to substitute self raising flour cause we only have all purpose and cake flour around. What should i add or remove? Thank u!! Hi again kerry thanks.for the reply. So do i still put 3tsp of baking powder even if the self raising flour recipe has baking powder in it too o i can exclude the 3tsp baking powder? Hi Kirsty – as the recipe says, its around a tsp of each colour, but the really important thing is that the batter is brightly rainbow coloured before it goes into the oven. If it is, there’s no way it could come out colourless… Hope it turned out okay! I made my niece a beautiful birthday cake! very impressive with little effort if you read the advice carefully!